Welcome to Sneak Peek, our weekly lookahead for both ends of Pennsylvania Avenue, plus my best scoops. I'd love your tips and feedback: jonathan@axios.com. And please urge your friends and colleagues to join the conversation by signing up for Sneak Peek. 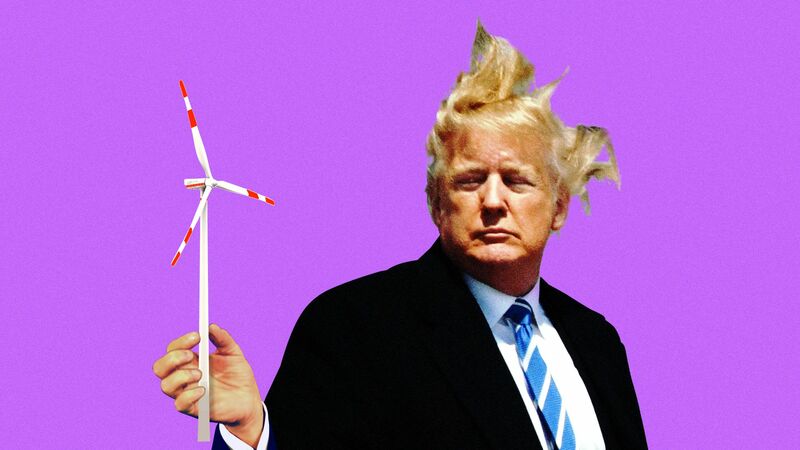 During White House discussions about renewable energy, President Trump has declared — more than once and to the amusement of senior administration officials — "I hate the wind!" Trump has a visceral hatred of wind turbines. He believes they are terrible returns on investment that blight coastlines and obstruct views, sources with direct knowledge tell Axios. Trump has even told officials to "think of all the birds" that wind turbines are killing, though sources familiar with these comments tell us they doubt the president actually cares about endangered wildlife. And yet, Axios' Amy Harder writes that the Trump administration is working hard to promote wind farms up and down the Atlantic Coast. Trump's Interior Department is working with Democratic-led state governments to lease federal waters for wind off Massachusetts and nearby states, and also working to streamline permitting to make it easier for companies to build offshore wind farms. Why this matters: The Trump administration's energy policies reveal an extraordinary gap between the president and his administration. "His policy is, wherever he goes he likes what they have," said a source with direct knowledge of the internal White House energy discussions. "Even if it's contrary to what he said at the last place. He basically just tells everyone what they want to hear; that's his energy policy." In response to Axios' reporting for this story, White House deputy press secretary Hogan Gidley said the president had directed Energy Secretary Rick Perry and Interior Secretary Ryan Zinke "to promote and execute policies within their Departments to achieve Energy Dominance and energy independence — and that's exactly what they have done." "The Trump Administration is consistent and clear in its commitment to continuing drastic reductions of regulatory burdens that have stifled growth in the energy industry for far too long." 1. In private conversations with administration officials, Trump has said he loves hydroelectricity. And yet, he hasn't publicly supported what would help the most: legislation in Congress speeding up the federal licensing process. He aggressively backs a federal ethanol mandate at the EPA requiring refiners to blend biofuels with gasoline. His Energy Department is considering using decades-old laws to prop up economically struggling coal and nuclear power plants. That would amount to the biggest government intervention in electricity markets in decades, possibly ever. "The biggest contradiction," the source with direct knowledge of the internal discussions said, is that "Trump will literally say 'we'll save coal' and in the next sentence that we'll become 'energy independent.' You can't do both. The natural gas boom is coming at the expense of coal." Secretary of State Mike Pompeo will lay down an important marker for China in a speech on Monday at the U.S. Chamber of Commerce's Indo-Pacific Business Forum. Pompeo won't say this explicitly, but he'll subtly tell China's neighbors they don't have to choose Chinese investment over American investment. Axios has been briefed on the speech from a source with direct knowledge of its latest contents, as of early Sunday evening. Pompeo is expected to frame the speech as a discussion of the Trump administration’s "economic strategy for advancing a free and open Indo-Pacific." Expect Pompeo to say that "America will be there and American businesses will be there. The American people and the whole world have a stake in Indo-Pacific peace and prosperity. That is why the Indo-Pacific must be free and open." Between the lines: Pompeo has a tough job selling the Trump administration's economic engagement in Asia. One of Trump's first acts as president was withdrawing the U.S. from the region's biggest trade deal — the Trans-Pacific Partnership. Many smaller Asian nations worry about an American retreat from the region and have begun to see an emboldened China fill the vacuum. A similar dynamic is occurring in Europe. But most countries around the world would still, if given the choice, far prefer to deal with America over China. China has been operating like a pay-day lender as it aggressively expands and lays down major investments around the world. Pompeo's speech will highlight the U.S. business advantages of reliability and transparency: "Thanks to [our] history of economic and commercial engagement, America’s relationships throughout the Indo-Pacific today are characterized by mutual trust and respect. American friendship is welcomed, and American businesses are recognized for their ingenuity, reliability, and honesty." Behind the scenes: About a half-dozen Cabinet secretaries and agency heads, including Wilbur Ross and Rick Perry, will lay out the administration’s economic and commercial strategy for the Indo-Pacific at the event on Monday, the source said. Trump is obsessed with the FBI building. For months now, in meetings with White House officials and Senate appropriators intended to discuss big-picture spending priorities, the president rants about the graceless J. Edgar Hoover Building in downtown Washington, D.C. Behind the scenes: In the midst of one rant about the FBI, he lit into the building. "Even the building is terrible," he observed to an Axios source. "It's one of the brutalist-type buildings, you know, brutalist architecture. Honestly, I think it's one of the ugliest buildings in the city." Another source said he was dead opposed to plans to move it out of D.C. "This is prime real estate, right on Pennsylvania Avenue," he said. "This is a great address. They need to stay there. But it needs a total revamp." That source said Trump told Chief of Staff John Kelly he wants to oversee the project at an excruciating level of detail: the cost per square foot, the materials used, the renovation specs, etc. He's treating it like it's a Trump Organization construction project, the source added. The White House response: In response to my emails about this story, a senior official said, "POTUS has interest in the issue and has met with FBI officials, but more importantly the GSA [General Services Administration] team. GSA has concerns that the building can't be rehabilitated particularly given the security requirements and has relayed that to him." What's next? The FBI hasn't submitted a plan for a new building to Congress, and Congress hasn't appropriated any money for the project. The senior official added that the FBI leadership and work force would prefer to stay in D.C. and "are working with GSA for optimum design for the Bureau's needs and at lowest budget, fastest timetable, etc." Be smart: To risk stating the obvious, it's highly unusual for the president of the United States to micromanage a building project. Responding to this story, White House press secretary Sarah Sanders said: "POTUS is always interested in building because he knows it better than anyone and has been very successful in it. He's found GSA to be on it, 'very impressive' and 'knowledgeable' are the phrases he has used." President Trump tweeted this morning that he is "willing to 'shut down'" the government this fall if congressional Democrats don't help to pass his immigration agenda. "I would be willing to 'shut down' government if the Democrats do not give us the votes for Border Security, which includes the Wall! Must get rid of Lottery, Catch & Release etc. and finally go to system of Immigration based on MERIT! We need great people coming into our Country!" Between the lines: The consensus from senior administration officials and Republican leadership sources I spoke to today is that he's serious, but will not shut down the government before the midterm elections in November. I’ve yet to speak to a Republican member who believes leadership can deliver the wall funding Trump wants by the end of September. It's notable that Trump's threat didn't come with a deadline. Behind the scenes: Trump met with Mitch McConnell and Paul Ryan on Wednesday and they agreed the border wall funding doesn't need to be one of the bills settled before the end of September, according to sources familiar with the meeting. Trump wants to pick a fight over the wall — eventually. Sources with direct knowledge tell me it appears he's been persuaded that a shutdown fight at the end of September would badly interfere with McConnell's efforts to confirm Trump's Supreme Court nominee Brett Kavanaugh. This means the real wall funding showdown is likely in December, after the midterms. Be smart: The more interesting dynamic to pay attention to — because it's happening quietly and getting very little media coverage — is the tussle between the debt-loving president and his penny-pinching Budget Director Mick Mulvaney. Mulvaney has been privately pushing Trump to get more aggressive about cutting spending, but debt and deficits have, so far, only ballooned under Trump. The House is on recess. The Senate will vote on Monday evening to confirm Judge Britt Cagle Grant to the Eleventh Circuit. The Senate will pass the National Defense Authorization Act and an extension of the National Flood Insurance Program. The flood bill extends until November funding that was set to expire on July 31. Both bills will go to the president's desk for signature this week. Senate leaders also expect to vote to go to conference next week on the Farm Bill. Monday: Trump receives his intelligence briefing, participates in the swearing-in ceremony for the new Veterans Affairs secretary, Robert Wilkie, and hosts the new populist Italian Prime Minister Giuseppe Conte at the White House. Tuesday: The president has a busy day. He will have his intelligence briefing, sign H.R. 2353, the "Strengthening Career and Technical Education For The 21st Century Act" into law, have lunch with Secretary of State Mike Pompeo, host a roundtable discussion on workforce development in Tampa, Florida, and throw a rally in Tampa. Thursday: Trump receives his intelligence briefing, hosts a roundtable with supporters in Wilkes-Barre, Pennsylvania, and throws a rally in Wilkes-Barre. 6. 1 déjà vu thing: Deficits will come down soon! In a March 2016 interview with The Washington Post's Bob Costa and Bob Woodward, then-candidate Donald Trump claimed that if he got elected president he would eliminate the United States' $19 trillion debt in just eight years, without needing to increase taxes. Expectations have shifted a little. Far from reducing the national debt, during the first 18 months of the Trump presidency, debt and deficits have ballooned, with plenty of help from the Trump tax cut bill. But hope springs eternal, at least in one quarter of the White House. Kudlow: "... for Mick Mulvaney, our budget director, and President Trump, we are going to be tougher and tougher on spending, OK, tougher and tougher on spending. That's part of the deficit calculation, as you well know." Kudlow: "... I believe a combination of faster economic growth over the next bunch of years, Jake, as well as much tougher on spending will still get that deficit down..."